I was in Germany recently. My agency’s global network has a challenge shared by many media agencies, I suspect: how to formalise its development and distribution of content on behalf of its clients. Content distribution is pretty much what we do already. Sure, the content we use and the channels available to us are proliferating at lightning speed, but the core principles of navigating a consumer towards a brand (as opposed to the way around) haven’t changed. But media agencies developing content? Really? Media agencies have for a while seen themselves as the angels on a client’s shoulder. We’ve been telling them the world has changed. That campaigns need to be more ‘engaging’ or three-dimensional. All to easily we’ve probably characterised ad agencies as the devil on the other shoulder. They tempt the client with yet another expensive, short-shelf-life, we-open-on-a-beach-and-here’s-the-production-bill-thank-you ad production. But, inevitably it’s that sort of agency, well-versed in production and selling things that need to be made, that are benefiting most from our sell. While media agencies talk in terms of potential, ad agencies go and make. Increasingly, in a digitised, ‘social’ world, it feels like ideas are once again the currency of a successful agency. Because advertising is based on interruption. Media facilitates this interruptionby allowing brands to buy their way in to people’s routines. But interruption doesn’t work when the normal rules of intervention don’t apply. You can’t buy your way in to social media. Mel the other week apologised to me from the stage for advocating great ideas that don’t need paid-for media. But really I couldn’t agree with her more. I think if you have to resort to buying attention then you’ve failed. So, paradoxically, while media agencies can tell clients about shift in traffic, or the increasing control consumers expect over their media, they’ve not always been able to articulate how a brand should respond. Now, I don’t believe for one moment that’s because media agencies aren’t capable of coming up with those ideas. But when you’ve grown up evidencing recommendations with promises of eyeballs and traffic it comes as a a surprise when clients, in the absence of being able to see the film/poster/message/game/competition/whatever, don’t meet you halfway. So media agencies are potentially just as disrupted as ad agencies nowadays. If we’re not buying the space, just what do we do? Put that way it’s easy to see why ad agencies, who have always created ‘content’ in its most obvious form, believe they have an equally central role to play in a new world unconfined by old-fashioned notions of 30″ or, if there’s lots of money, 60″ or, if we’re feeling really brave, 90″. Ad agencies don’t make ads. They might write them, and make their account man stand up and read out the scripts in order to sell them, but they don’t make ’em. They use, have always used, production houses, directors, etc to bring to life what clients have bought before it’s even made. How about that, media people? Creating ideas powerful enough to make clients want to buy that they’ll pay you for no matter how they turn out, or how effective they are? That’s what we need to get better at. I’ll say, now, though, then I’m not particularly happy with the word ‘content’. It turns out to be incredibly difficult to define. I asked Twitter when I was in Germany debating this. Lisa said this, which I love. I love it because Lisa is a journalist. In fact, she’s beauty and style editor at Marie Claire, so she knows a bit about turning ideas, trends, product, whatever, into content. It’s a helpful reminder that there’s a world of people and disciplines that do all this already. Liam got punchier, or more self-effacing anyway. And after all this I realised something strange. What media agencies currently sell – the box around content – is easy to describe, but on its own can’t sell a strategy because it’s so abstract. 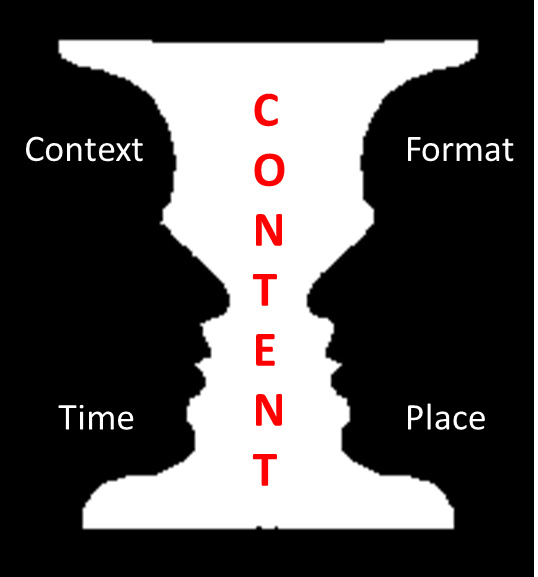 What we want to sell – content that sits in the box – is quite an abstract thing to describe, but a relatively easy thing to sell. For media agencies, it’s like content is negative space. It’s what the eye is drawn to, but we’ve given more definition to what surrounds it. What gets media agencies into the content conversation is, of course, ideas. Ideas give definition to content. They fuel what sort of content needs to get made. And ideas are what clients actually want.